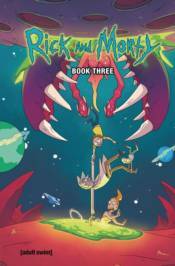 The hit comic book series based on Dan Harmon and Justin Roiland's hilarious [adult swim] animated show RICK AND MORTY� is available in its third deluxe hardcover collection! Catch up on the adventures of sociopathic genius scientist Rick Sanchez and his inherently timid grandson Morty Smith as they embark on dangerous adventures across the universe! Recoil at the despicable Doofus Jerry and his attempt to take over the family (and the world)! Relive the joys and sorrows of Tiny Rick! Join Summer and Mr. Poopybutthole on their own adventure through fame and misfortune! All that and more in this oversized collection! This special edition collects issues #21-25 of the main series, as well as the entire Lil' Poopy Superstar miniseries. It also includes a brand-new introduction, over thirty pages of extras, and an exclusive sound clip voiced by Justin Roiland. Wubba lubba dub dub!